Are there benefits to choosing side-snapping cloth diapers? 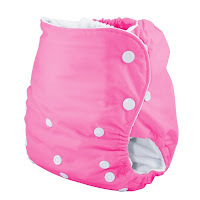 If you're anything like me, when you're first shopping for cloth diapers you are looking at diapers that look and work the most like disposables, that is with the velcro fastening system in the front. Some of my very first diapers were DryBee's pockets, they served me well and it was quite some time before I actually bought and tried my first side-snapping diapers. However once I tried Knickernappies I wished I had them from the start! At first glance side-snapping diapers might look tricky to use or hard to fasten on a squirming baby, I assure you they are not. In fact there are a lot of benefits to side-snapping diapers that you might not know about. They are HIGHLY adjustable, top and bottom snaps, usually with a mi nimum of 4 settings give these diapers as close to a perfect fit as you can imagine. Perfect for babies with chunky thighs because of the customizable settings. Sized pockets provide a trim and perfect fit while the Onesize its babies and toddlers up to 40lbs and beyond! Perfect for when you have more than one child in diapers. A solid layer of PUL across the tummy is perfect for tummy sleeping babies. Some diapers have a tendency to wick through the stitching around the aplix, with side-snapping diapers there is no such problem. Ther OneSize Knickernappies Pocket Diaper gives you all the benefits of side-snapping diapers as well as the fact that it is capable of fitting from birth to potty training, 8-40lbs! It is available with two sizes microfiber inserts or with two LoopyDo inserts, the #1 Rated Insert on DiaperPin! It is the only diaper on the market that comes with the option of upgrading to our ultra absorbent LoopyDo inserts which contain both microfiber and hemp! Personally, since I didn't have super chunky babies and I didn't have a need for them to wear diapers beyond 40lbs, the HUGE and most important benefit to me was the solid front panel which prevented wicking. All three of my kids were tummy sleepers, it's just how they slept the best and most comfortably. 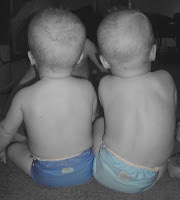 Before we started using Knickernappies I could just about guarantee that every time they laid down to sleep their diapers would leak through the front snaps or stitching around the aplix getting their clothes and sheets wet. I believe that side-snapping diapers are a must try for every cloth diapering family! Do you love side-snapping diapers? Show your love by posting your comments and questions below and let us know why you like them compared to other styles. Labels: snaps vs. velcro, why side-snapping? My son is also a tummy sleeper but sometimes he will sleep on his side. When he does this the diaper leaks on the side and he is all wet. Is there a way to prevent this on the Knickernappies since they are side snapping? Thanks! Why choose Knickernappies Stay-Dry Hemp Doublers! HE Washing Machine Tips and Tricks!